Join us at ArtRage this fall as we hold an event series in honor of the 100th anniversary of Women’s Suffrage in NYS. The Suffrage Centennial offers us a time to look back and reflect on the accomplishments women have made and challenges they have faced in the struggle for gender equality. As we mark the historic milestone of our ancestors’ activism we recognize that the struggle for gender equality is far from over; and today’s women know it. In January 2017 we saw the largest protest in US history: the Women’s March on Washington with sister marches all over the country. We hope this series will offer the community a time to come together, acknowledge, discuss and be inspired to work for a more just society for all. Thursday, September 28 at 7pm – !Women Art Revolution – Film screening documenting the feminist art movement beginning in the 1960’s. Hosted by Syracuse artist, Jessica Posner. Sunday, October 1 at 3pm – Celebrating 100 Years of Women’s Suffrage in New York with The League of Women Voters of Syracuse. Wednesday, October 11 at 7pm – Women Voted in New York before Columbus – Humanities NY Public Scholar presentation by Sally Roesch Wagner. Friday, October 13 at 7pm – Body Butter Politic – a 40 minute performance art film by Jessica Posner. Sunday, October 15 at 3pm – Chisholm ’72: Unbought & Unbossed – Film Screening hosted by Linda Brown Robinson. Thursday, October 19 at 7pm – Seen and Heard Artist Talk – Join the artists from the Seen and Heard exhibition for a community dialogue reflecting on the current exhibition. Saturday, November 4 at 7pm – Still the One: Douglas Lloyd Makes Portraits of Women Making Change The Old-Fashioned Way – Opening Reception. Sunday, November 12 at 3pm – Oral History Workshop – Learn the basics for recording oral histories of our community elders. 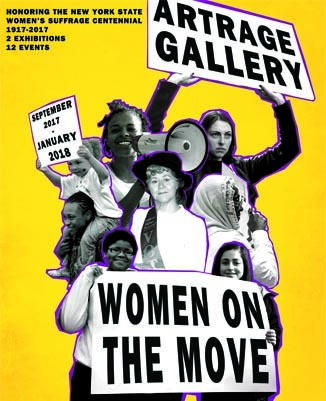 Saturday, November 18 at 2pm – Still the One Women’s Dialogue – 25 women subjects of our exhibition, Still the One, gather to share their stories with their portraits as a backdrop. Saturday, November 18 at 7pm – Iron Jawed Angels – Film Screening hosted by Dr. Susan Goodier, author of Women Will Vote: Winning Suffrage in New York State. Wednesday, December 13 at 7pm – Artist Talk with photographer Douglas Lloyd – Lloyd will discuss the collodion wet plate process that was used to create STILL THE ONE exhibition images. Presented with support from the County of Onondaga, administered by CNY Arts, CNY Community Foundation, the Reisman Foundation and Humanities NY; Any views, findings, conclusions or recommendations expressed in these programs do not necessarily represent those of the National Endowment for the Humanities. Community Partners include, the Syracuse Chapter of the National Organization for Women, the League of Women Voters of Syracuse Metropolitan Area, the Syracuse Chapter of the NAACP, the National Association of Social Workers-NYS -CNY Division and the Onondaga Historical Association.